There’s something brewing in Halifax’s coffee scene, as new cafes distinguish themselves from the city’s coffee heavyweights. 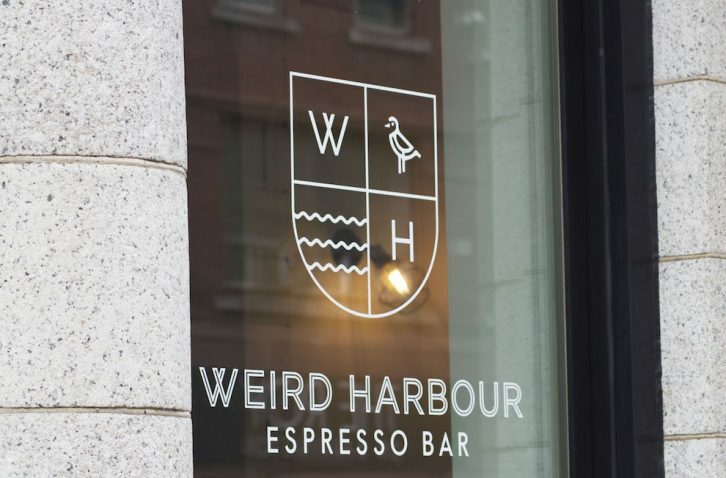 The city’s newest coffee spot, Weird Harbour Espresso Bar, opened its doors in mid-October. So far Weir is the only full-time barista. The cafe is two doors down from Starbucks Coffee, which has been on the block for years, but Weir says he’s not worried – there’s enough coffee love to go around. There are more than 40 cafes throughout the downtown district, according to the Downtown Halifax Business Commission‘s annual 2016-17 report. Downtown is home to established cafes including Steve O Reno’s Cappuccino, Cabin Coffee, Two If By Sea, Smiling Goat Organic Espresso Bar and Trident Booksellers & Cafe, which has been around since the early 1990s and is a fixture in the city’s coffee community. With local roasters like Java Blend, Anchored Coffee and North Mountain Fine Coffees, most independent cafes opt to use their coffees. “In this market ‘buy local’ has taken hold and there’s a strong attachment to it here in Nova Scotia,” says Paul MacKinnon, the business commission’s executive director. Weird Harbour does not use beans from a local roaster. 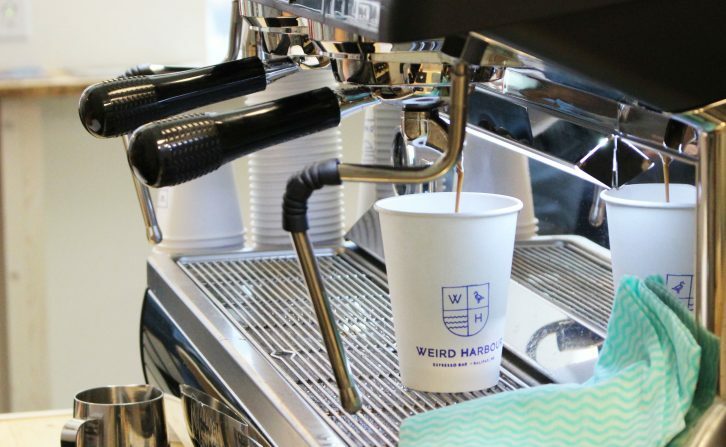 Weir serves Detour coffee, from a popular Toronto roaster he’s worked with for years. “There’s such a good community of folks around here and, of course, you want to support them as much as possible. My only thing is, because there are only a few roasters around town, I (thought), ‘do I want to offer something local or do I want to offer something that’s a little different,’” says Weir. And while Pavia Gallery Espresso Bar and Cafe’s drip coffee is roasted by Nova Coffee, which has been operating since 1973 and is based in Lower Sackville, its espresso roast is imported from Italy. “When it comes to our espresso, we tried to mimic what they had in Italy and we couldn’t,” says Pavia’s co-owner, Christopher Webb. Pavia began with Webb and Victoria Foulger, with Webb’s mother doing all of the baking. Once they became more established in Herring Cove, Webb says they decided to submit their proposal to become the new Halifax Central Library’s cafe. They won that tender and in December 2014 opened two locations, on the first and fifth floors of the Spring Garden Road library. Last October they won the tender to be the Art Gallery of Nova Scotia’s cafe and opened a fourth location this summer. “We’re a proud and independent local business,” says Webb. Webb says that there were some hard times, but it’s proved worth the risk five years later. “We thought, we should at least do it the way we want, so we didn’t open up a place called the ‘Herring Cove Cafe.’ We opened up a contemporary art gallery. The first six months people didn’t even know we sold coffee,” says Webb with a laugh. Since 2011, their full-time staff has grown from six people working at their original Herring Cove location to a total of 35 at the four locations. MacKinnon says independent businesses are thriving and there are more independent coffee shops in the downtown core than there are chains, such as Tim Hortons and Starbucks, in the city. 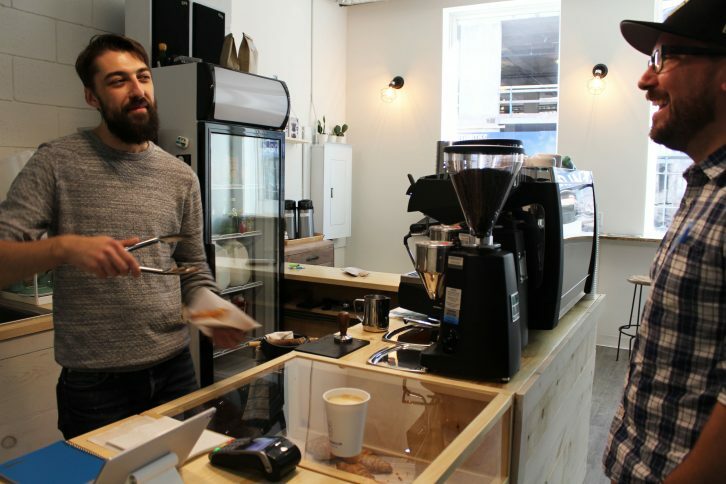 In addition to cafes, MacKinnon thinks Halifax will begin to see more independent roasters, citing the success of Dartmouth’s Anchored Coffee and Lunenburg’s Laughing Whale Coffee. Lucky Penny Coffee Co. opened in September and Dilly Dally in June. Both are located on Quinpool Road. The Cortado Tasting Room in Bedford opened in September. 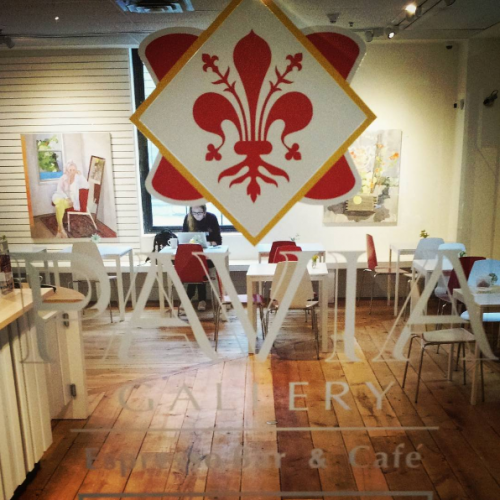 Pavia Gallery Espresso Bar and Cafe opened its fourth location at the art gallery in May. Dan Weir has worked in Montreal and Toronto coffee shops as a barista for the better part of a decade. But without the Centre for Entrepreneurship Education and Development’s help, he says, his Weird Harbour cafe – his first business – wouldn’t be a reality. Weir, alongside a select group of self-starters, will graduate in November from the Self-Employment Benefits program delivered by the centre. Many new and established coffee makers, including Two If By Sea and Pavia Gallery Espresso Bar and Cafe, have connections to the 40-week program, which is funded by Employment Nova Scotia and gives new entrepreneurs the guidance they need to build their businesses. The program “is giving people an opportunity to step out and show what they’ve got. Two If By Sea was just another coffee shop and now they’re a staple in downtown Dartmouth,” says Caitlin Patterson, CEED’s communications representative.